Make mornings worth waking up for with a built-in coffee machine. The VC801 can prepare barista quality drinks at the touch of a button, using ground coffee or whole beans. We have included a complete selection of settings to allow you to create your coffee just as you like it. Tall, medium, short…strong or normal, however you take it this machine will also remember your settings so that you can get up and go in the morning. With take away coffees costing upwards of £2.50, you could potentially save yourself £650 a year; based on the average 260 working days we have here in the UK. That and the potential saving of 260 non-recyclable take away coffee cups is a brilliant reason to consider your very own, at home coffee machine. There are so many coffee machines on the market that it is difficult to choose between them. 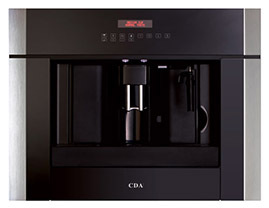 A counter top coffee machine might seem like a great addition to the kitchen, especially when models are on sale. Unfortunately they take up valuable worktop space, are difficult and time-consuming to clean and often only work with expensive, bespoke coffee and milk pods. You could end up spending more over time on the specialist coffee and the unit itself, ending up wondering if you were better off sticking to the barista’s brew on the high street. 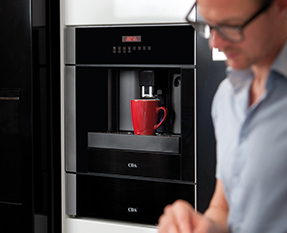 A built-in coffee machine is an excellent solution for getting a perfect coffee making facility into your home without the mess, fuss and maintenance of a standalone unit. Once fitted, the coffee machine is easy to clean with a flush glass frontage and removable drip tray that can be chucked through the dishwasher. What’s more the entire unit slides out on specialist runners, allowing you to top up the coffee easily and conveniently for a super-fast ‘brew and go’ in the morning. This model takes whole coffee beans or ground coffee, both are styles that you can easily buy at your local supermarket; you could even pop in to your previously frequented coffee shop and buy their ground brew for your own machine at home. Setting your personalised preferences couldn’t be easier with the electronic control panel, simply touch through the options and set up your perfect coffee. Your machine will remember your settings to ensure that you get the perfect cup, every time. Combine the VC801 with a built-in accessory drawer to store your espresso cups, saucers, sugar cubes and spoons for an all-in-one coffee station solution. The built-in unit looks perfect when positioned in a bank of compact appliances or when installed alone in any style of kitchen. For the city flat, for example, with a smaller kitchen space available, a built-in coffee machine, wine cooler, steam oven and microwave could be everything you need for a professional & convenient lifestyle. Tasting is believing with a coffee machine at home. Once you have freshly ground coffee available at the touch of a button, with very little effort, you will never be able to go back to that jar of instant.